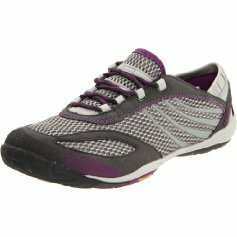 If you are looking for a great pair of shoes for running or walking, check out today’s top bargain on Amazon, a pair of Merrell Women’s Barefoot Pace Glove Running Shoes for only $49.99 (Regularly $100!) with FREE shippping and FREE returns. Choose from colors Dark Shadow or Black. These highly rated running shoes have over 480 reviews and have earned an average rating of 4.6 out of 5 stars! Take a look at just a few of the great reviews. “These shoes are wonderfully fit, they slip on like a glove and feel like nothing 😀 I am using them for running/cycling/daily wear.